Different groups perceive fundraising operations differently, and this greatly affects advancement services. How do I know this? While it’s an intuitive aspect of fundraising operations work, the data are pretty clear. I completed a study in the last few weeks. 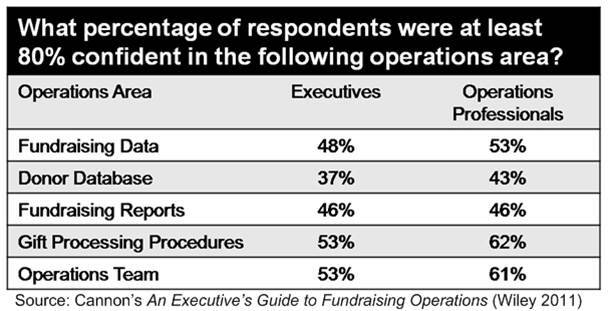 The survey is an extension of work I conducted for An Executive’s Guide to Fundraising Operations, which explored how differently fundraising executives and operations professionals perceive their data, reporting, technology, and processes. Here is a summary of those 2011 responses. These show that, on average, operations professionals are more confident in their work than their bosses. Cannon’s study shows the executives aren’t as confident in their operations as those doing the work. My July 2013 study focused on understanding how those with and without a “portfolio of prospects” perceived their organization’s operations and their inclusion of operations in their work. A group of 334 respondents (two-thirds of which maintain a prospect portfolio) shared their perceptions. The results mirror the responses from 2011. In general, those with a portfolio of prospects were less satisfied with their operations than those without a portfolio (typically, operations professionals) were confident in their services. Cannon’s 2013 study shows that frontline and operations professionals have much different perceptions. So, what do we make of this? Both groups need to take a walk in the others’ shoes. Operations are probably better than gift officers think and could be improved more than operations professionals would like to believe. Communication is essential, too. We need to work on managing expectations, while delivering as solid an operations environment as our resources, hard work, and good thinking allow. There are more recommended next steps about dealing with this new data in the report. Click here to read more.